Learn more about the NFRA's history, our bylaws, the NFRA Statement of Principles, and national membership. So join the NFRA today! Become a National Member FREE by typing FREE in the bottom box or pay your dues and become a voting National Member. Together, we can take back the machinery of politics, and by doing so, we can change politics for good. Should conservative activists in California work together with conservatives in Nebraska or Maine? Does the actions of a state committee in Florida work against the interests of conservatives in Idaho? When the Republican National Committee targets a race in New Jersey, does that help or hurt a conservative running for congress in Arizona? It was these questions, and others, that brought conservative leaders from 12 states to Las Vegas, Nevada in December, 1996. After the disaster of the November, 1996 elections, where the Republican nominee for president didn't read, and stated he refused to read, the Platform of the National Republican Party, it was time for conservative activists from around the nation to respond. The organizational meeting of the National Federation of Republican Assemblies was called by the California Republican Assembly (CRA) and the Arizona Republican Assembly (ARA). The CRA had been formed in 1932 and incorporated in 1934 as a grass root group of "Young Turks" to take back the GOP from special interests and the elite in California. By 1964, the Goldwater conservatives had taken over the CRA and made it the leading organization in California for conservative activists. It was in the forefront of the Goldwater and Reagan (for Governor) campaigns, Proposition 13 (property tax reform), Prop. 187 and 209, among many others. The CRA has had an important impact on the California Republican Party; the last three chairmen of the CRP have been active members of the CRA. The Arizona Republican Assembly was chartered in 1993, with more than 200 people at the organizational meeting. Together these groups made a strong impact on elective politics and issues. By 1996 it became apparent that this had to go national, since the Republican Party was under attack by RINOs (Republicans In Name Only). So a call to conference went out, and such national conservative leaders as Phyllis Schlafly and Michael Ferris attended. It was decided to form a national organization, state by state, of conservative leaders and activists. This would be a "bottoms up" organization, with the strength and the power in the community chapters, not the state or national organizations. These groups would endorse conservative Republican candidates for city council, school board, other local partisan and non-partisan seats, as well as state legislative, constitutional and congressional seats. Committees were formed to create Principles, Bylaws and the administrative direction of the NFRA. In August, 1997, representatives from 18 states met in St. Louis, Missouri to officially form the National Federation of Republican Assemblies. Since then, more than 40 states have either chartered or organized a Republican Assembly, endorsed hundreds of candidates, have held national board meetings and conventions. We have been co-sponsors of the Conservative Political Action Conference (CPAC), have appeared in the Wall Street Journal, the New York Times, the Washington Times, the Los Angeles Times, as well as many other national journals and newspapers. We understood that liberals, candidates, money and ideas, travel from state to state. Conservative activists knew that outsiders were coming into their state to work and control the political agenda. Yet, there was no network of conservatives working on a grass roots level to respond to the challenge, investigate, pass information to activists, and to network with other conservatives. Unlike the D.C. based organizations, this was, and is, to be a grass roots, community-based organization that stands for principle, and where precinct workers could be found, trained and activated. We have an elected national Board of Directors. This Board consists of officers and three representatives of each chartered Republican Assembly. Resolutions and endorsements are based on the Principles of the organization, rather than temporary political winds. We are not chartered by the Republican National Committee, but we do work within the framework of the Republican Party. Today, on a national level, we are working with other conservative groups to create a strong strategy to invigorate the movement inside and outside the Beltway. In the states, we are active with the State GOP, legislators, and other activists to form coalitions to promote Constitutional government. On the local level, we are involved with school boards, city councils, and local issues of both an economic and moral nature. As a national organization, we were able to bring information to conservative activists on a local level through our thrice weekly e-mail newsletter, THE CONSERVATIVE REPUBLICAN. This was started a few months after the founding of the NFRA under the title FRAMING THE ISSUES. Today, we connect with conservatives directly and instantaneously through social media, including Facebook, Twitter, and LinkedIn. The NFRA also helps bring financial and up-to-date campaign resources and technologies to our local clubs. We are the "Republican Wing of the Republican Party" . The NFRA stands for principle, the United States Constitution and for conservative values. Unlike the RINOs, we know that more government means less freedom. For Constitutional Freedom, join the NFRA. 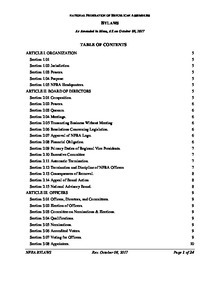 Download "NFRA-Bylaws Approved October 08, 2017 Mesa, AZ.pdf"
'Section 1. The seventeenth article of amendment to the Constitution of the United States is hereby repealed. 'Section 2. The Senate of the United States shall be composed of two Senators from each State, chose by the legislature thereof, for six years and subject to recall by the legislature; and each Senator shall have one vote. 'Section 3. The pay and benefits afforded each Senator shall be determined by the legislature of the State and appropriated by that legislature and paid from the State's treasury. No Senator shall draw any pay, remuneration, or benefit from the Federal Treasury. 'Section 4. If vacancies happen by resignation or otherwise, during the recess of the legislature of any State, the executive thereof may make temporary appointments until the next meeting of the legislature, which shall then fill such vacancies. 'Section 5. Upon ratification of this Amendment the Senate shall be prorogued and new members appointed by the State legislatures. RESOLVED, that copies of this Resolution be sent to the Governors of the 50 states, the leader of the upper chamber of each States' legislature, the leader of the lower chamber of each States' Legislature, all media outlets, and grassroots organizations. Prohibit the collection, tracking, and sharing of personally identifiable student and teacher data except with schools or educational agencies within the state and guarantee all individuals the right to prevent non-academic, personal data from being collected or shared. RESOLVED that copies of this resolution shall be posted on the NFRA website, transmitted to NFRA membership, and be distributed to all members of Congress, the Chairs of the State Republican party of Hawaii, and the Chairman of the Republican National Committee.